*Kovo A.S, Dyil P, Ali A.F. *Kadurumba C.H, Ogunsola T.M, Nwogu-Chibuike C.G. *Oshoma C.E, Obuekwe I.S, Osawaru E.
*Airoboman A.E, Wamdeo C.L, Lawan S.
*Orhorhoro E.K, Erameh A.A, Adingwupu A.C.
Chemical Engineering Department, Faculty of Engineering, University of Benin, PMB 1154, Ugbowo, Benin City, Edo State, Nigeria. 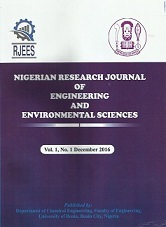 Copyright © 2016 Nigerian Research Journal Engineering and Environmental Sciences. All Rights Reserved.